Earlier this year, we took the larger size range of the School Days Jacket and Coat pattern out of print. Now, due to popular request, we’ve brought it back for a limited time. 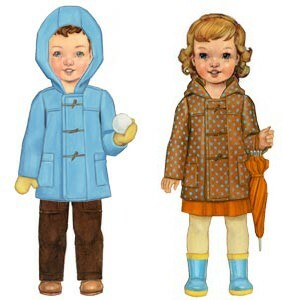 This unisex pattern contains options for both a heavy winter jacket and a lined, three-season raincoat. We think you’ll be excited to see some of the waterproof, coated fabrics (which are perfect for raincoats) that are coming out next spring from us and from other designers. This pattern is now available, again, on our website. Adorable..I do love doll cut-outs. I need to put some up on my wall and play dress up with them.